There are tons of reasons for a computer to become slow. You might not have enough RAM, your computer may be too old for the programs you’re trying to run, or an app or a Windows process is eating up all your CPU resources. In this article, we’ll help you find out which program is using up CPU on your PC and fix the problem. Why Do Some Programs Use Up 100% CPU? First of all, 100% CPU usage is very common on older or less powerful computers when they are trying to run programs that require too much system resources. That why your processor can’t cope and the CPU usage becomes sky-high. When that happens, you can’t use your PC because it’s simply stuck. Sounds nasty? You bet! But what if you have a pretty good computer and your CPU goes to 100% and stays there from time to time? That usually happens when a program or a Windows process decides that it has something extremely important to do and it needs all the resources it can get for that task. For example, Windows Update loves using up CPU and RAM when it downloads and installs large updates. Most of the time, the process should stop using more CPU than usual when it finishes whatever it’s doing. But sometimes it may get stuck and wreak havoc on your system. That’s why it’s important to learn how to find the culprit and fix it. So, let’s get on with it! 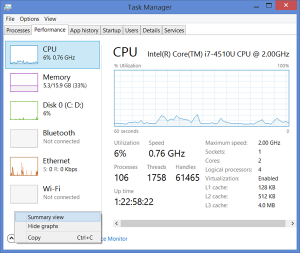 Luckily, Windows has a tool that will show you exactly which program is using up all of your CPU resources – the Task Manager. Press Ctrl+Shift+Esc and it will open. Then, if you’re on Windows 10, make sure you go to the advanced view and make the Task Manager show you processes from all users. When that’s done, go to the CPU tab and sort all running processes by CPU usage. The one that’s using the most CPU will be at the top. Now right-click on the process name and go to Properties. Hopefully, you’ll be able to understand what that process does straight away. If not, write down its name and Google it (and don’t forget to browse our site first). Is There an Easy Way to Fix 100% CPU Usage? Yes and no. Basically, it all depends on the problem. Sometimes a simple reboot will fix high CPU usage, sometimes running a program like Easy PC Optimizer to fix internal Windows errors will help. But sometimes the only way to go is to do research and fix the problem manually. Or ask your techie friend to do it for you.